Online Extravaganza Has Begun!! ~~ Paper & Embellishments On Sale for 48 Hours!! Happy Day After Thanksgiving ~~ And Welcome to our Black Friday kick off!! For the next six days, YOU get all the deals!! And we're kicking it all off today . . .
With 10% Off Paper and Embellishments . . . So NOW is the time to stock up!!!! Friday, Nov 23rd & Saturday Nov 24th: 10% Off paper, embellishments, & more. NOW AVAILABLE AT 10% OFF! To view the Friday & Saturday sale items in my online store, click here. Discounted items may be turned off if their supply reaches a predetermined threshold. We have set up each 48-hour sale this way so we are able to continue supporting the product through the life of the annual catalog. IMPORTANT – LINKS WILL ONLY WORK WHILE EACH SALE IS ACTIVE! Here we are at Tuesday again. I hope you are having a fabulous week, and getting lots of your "to do" lists accomplished. With the holidays staring us in the face, I know I have a lot on my "to do" list as well. I'm planning a break from blogging tomorrow (Wednesday); so be sure to join me again on Thursday for some CASE-Out fun, and we'll hopefully have a 3-Way Friday for Friday's segment (at least my plan says that -- LOL). Before we launch into today's "round-up" I just want to take a moment and share something with all of you. I know that we are a diverse group - that is what America is all about after all, correct? That means we each come from different backgrounds, beliefs, traditions, and political realms. I try very hard not to bring my viewpoints (especially politically) to this blog and to our stamping world. Here I want you all to feel that we can share our creativity and what we love in a safe environment. Whether or not we agree with each other on any particular topic, I work hard to "leave that at the door" each day and bring us all together with one common love - stamping and the creating of cards and gifts. Each of you is very important to me. When you are upset, it upsets me. If you have an issue, I encourage you to email me and chat with me about it. I am very open to any discussion. I also am here to support you, care for you, encourage you - whatever it is you need. I know we are walking through a very difficult time in our country and there are so many hot buttons - politically, racially, etc. My heart is burdened regarding all of this; but mostly that there may be people around me that may feel offended or are struggling through each day because they don't feel their voice is heard. At DDS Studios, we care about everyone, no matter your situation, stance, beliefs, or anything else. So please - do not feel offended . . . just talk to me!! Okay? You are all important to me!! So Big Hugs from me and Sadie Ann today!! Let's jump in and see what's going on this month! 5,4,3,2 . . . WONDERFUL!! THE YEAR END SALES EVENT IS HERE! Stampin’ Up! is wishing 2017 a fond farewell by throwing a Year-End Sales Event in its honor! The Year-End Sales Event is SU! 's chance to do a little inventory cleaning — and your opportunity to take advantage of special year-end deals on retiring and surplus items. The Year-End Sales Event will run from December 1, 2017, to January 2, 2018. But hurry, some supplies are limited. Due to high demand for retiring stamps, retiring stamps will be available until December 21 (not accessories—accessories are only while supplies last). Although this sale continues through January 2, 2018, items are not guaranteed through that date! The online store will be updated as items sell out. If there was something in the Holiday Occasions Catalog you were dreaming of having . . . now is the time to snap it up!! You can see the list HERE (or click on the image below) . . . you can head right on over to my Online Store and browse with pictures! But whatever you decide to do, don’t be disappointed…order today! PRE-ORDER WINDOW OPEN FOR THE FABULOUS STAMPARATUS!! I have some wonderful news for everyone today on the incredible fabulous Stamparatus! Our second Pre-Order Window opens today, and this time around . . . instead of a set number of units available for this window, there will be no limit. This window will stay open until December 30th, and all orders put in will be taken! That means, you don't have to worry about Stampin' Up! "running out" and shutting down the window. So get in there -- place that Pre-Order! Remember, your credit card will not be billed until the product ships to you next March. So you don't need "budget" right now today. You just need the credit card # in the order to hold your product. See all the details about the Stamparatus HERE -- and let me know if you have questions!! A Paper Pumpkin pre-paid subscription is the Perfect Gift for that special crafter in your life. From beginners to advanced, this monthly subscription kit is the perfect "crafting break" that we all need! You can learn more about Paper Pumpkin HERE. The graphic below gives you all the options for Paper Pumpkin subscriptions. I would strongly recommend this as the Perfect Gift for Christmas!! You can buy a prepaid subscription and give it as a gift. Just purchase the prepaid subscription and when you receive the redemption code, share it with the recipient of your choice who can redeem the subscription at PaperPumpkin.com . I can even help you out by preparing a "PP Gift Card" for you to slip into a cute envelope and give under the tree. Contact me today with questions or for assistance!! SPEAKING OF GIFT CERTIFICATES . . . It's that time of year. And for the hard to shop for Crafter or Stamper, the best solution is a Stampin' Up! Gift Certificate with your local Stampin' Up! Demonstrator. I offer 5 basic purchase levels/options to choose from. If you would like something more or slightly different from my Paypal options, please feel free to contact me directly and I'll be happy to work with you. See the details HERE. Don't wait to get those Christmas gift certificates wrapped up!! NEW SPRING OCCASIONS CATALOG ON THE HORIZON!! The new 2018 Spring Occasions Catalog is in Demonstrators' hands, and I know you've already been seeing sneak peaks around the internet on some of the fabulous new products coming your way on January 3, 2018. Sale-a-Bration kicks off with the new catalog in January, and I'm so excited about what is coming!! If you are a regular customer, I will be sending you your catalog package personally this next month. If you are not a regular customer, and would like to be included on the catalog mailing list, click on the "request catalog" link on the right-hand side of my blog, and I'll be sure to include you!! NEW SPRING PRODUCTS SHARES ARE AVAILABLE!! With a new catalog, comes a whole new collection of new designer papers, ribbons, and embellishments! I'm so excited every time we get a new release! The new Spring Product Shares Program has been posted. Just click on the Catalog Shares link to see what the new catalog offerings are and get signed up early!! Yesterday we showcased the beautiful Be Merry Ornament kit. This is our product focus this week. Could this be any cuter? The Be Merry Kit produces beautiful rosettes with all materials included in the kit to create 12 ornaments. You will adore this kit and the ease with which you can make ornaments, gift tags, décor, and more. See the picture above for more ideas with these adorable "rosettes." I LOVE them! And you will too!! I encourage you to order more than one kit and use them for gifts, tags, decor and so much more this holiday season. You can purchase your Be Merry Kit in my Online Store today!! Terrific Tuesdays Roundup . . . Build Up the Beauty . . . It's Tuesday! Whew! Can you believe the "flurry" this past weekend? 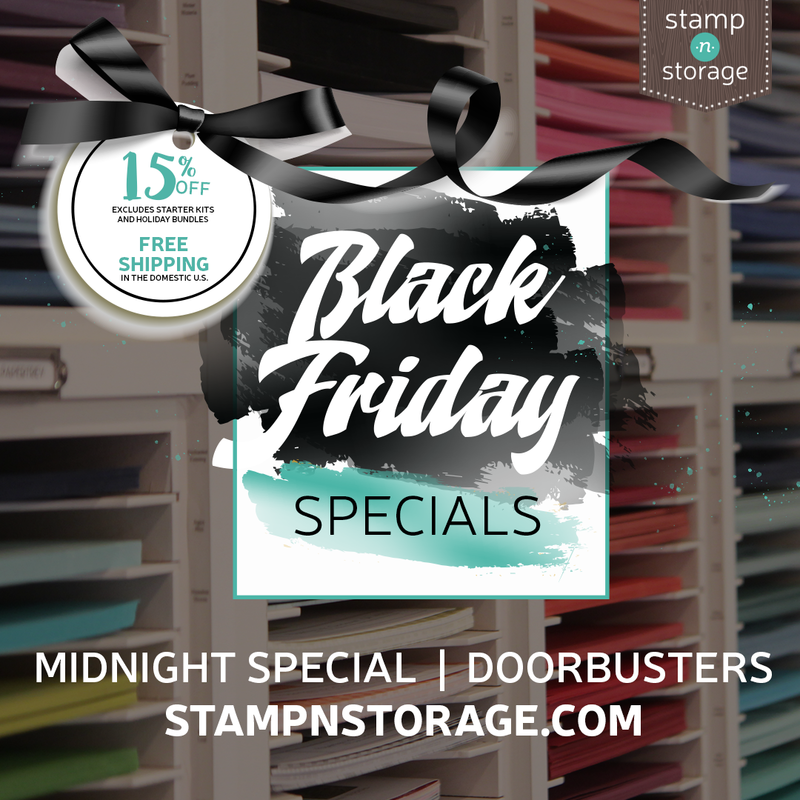 I hope you took advantage of Online Extravaganza, and most importantly our Free Shipping Event yesterday - something that does not come along very often with Stampin' Up! We will settle into the end of the year and the holiday season now. With the Holiday Occasions catalog winding down, we are now focusing on the soon coming 2018 Spring Occasions Catalog and Sale-a-Bration! Wooo Hooo - so hard to believe really! I hope I can inspire you with some last Christmas ideas and projects. And soon, if you are on my mailing list, you will have a new catalog to curl up with and enjoy and dream and plan! So stay tuned! We have lots of fun on the way. Let's round up all the going's on at Stampin' Up! and talk a little bit about what's coming soon! PAPER PUMPKIN . . . SO MUCH TO TALK ABOUT!! I'm so excited about this month's kit!! A D O R A B L E!! I hope you were part of the "surge" that ordered these past two months and are enjoying the full benefits of Paper Pumpkin!! Were you, like me, part of the 4% that ended up "backordered" on your November Paper Pumpkin kit? That's the side-effect of being soooo popular!! LOL So, here are some important updates for all Paper Pumpkin subscribers as to status of October and November kits, kit refills, etc., . . .
We have good news! We have received the additional inventory required to fulfill backorders associated with the October past kit. We will be shipping out these orders between November 28-30. November backorders remain on schedule to ship out between December 5 and December 11, as previously stated. We are not expecting anything to delay the fulfillment of backorders beyond this timeframe. If anything changes, we will let you know. We have received questions regarding the second billing for November. Normally, we run a second billing on the 20th of each month for those whose payment failed on the 1st billing. However, due to the lack of inventory, we delayed the second billing, pending the arrival of additional inventory. Due to system restraints, we are unable delay the second billing past November 30. Therefore, the second billing will run on November 30. Because the second billing will run before we receive additional inventory, those accounts successfully billed during the second billing will be placed on back order status until we receive additional inventory. We can confirm that backorders associated with the second billing will ship by December 11. If anything changes, we will let you know. Due to the November Paper Pumpkin back orders, we will not be offering refills of the November kit. Our first priority is to fill backorders. Once backorders are filled, we will determine if there is sufficient inventory to offer a November past kit. We will provide another update on 12/12 regarding any November past kit offer. NEW SPRING PRODUCTS SHARES ARE COMING!! With a new catalog, comes a whole new collection of new designer papers, ribbons, and embellishments! I'm so excited every time we get a new release! The new Spring Product Shares Program will be posted up shortly. Please be sure to check back by the end of the week at the Catalog Shares link to see what the new catalog offerings will be and to get signed up early!! BUILD UP THE BEAUTY . . . The Season Like Christmas stamp set is perfect for stampers who want the flexibility to create something simple and cute, while also having elements that lend well to a more intricate or advanced design. I've been itching to ink up this stamp set, and we'll be playing with it a little bit more later this week! Whether you use all the items and make a detailed and extravagant card (my style -- LOL), or simply choose your favorite to make a simple gift tag, you are sure to end up with a beautiful and festive creation. Be sure to check it out in my Online Store; and order today before it's too late!! THE YEAR-END SALES EVENT IS COMING SOON!! We're wishing 2017 a fond farewell by throwing a Year-End Sales Event in its honor! In just a few short days, you'll be smiling over special deals on select retiring and surplus items while supplies last. The Year-End Sales Event will run from December 1, 2017, to January 2, 2018, and supplies are limited. So stay tuned!! -- And get read to shop shop shop!